Flavors, like fashion trends, ebb and flow as tastes change—but chocolate will forever have a slot on the VIP list. And while chocolate liqueur may conjure notions of decadent drinks that are more milkshake than cocktail, this homemade crème de cacao from New York restaurateur Eamon Rockey captures the toasty, nutty flavors and delightful bitterness of dark chocolate. Rockey keeps a batch on hand for classic cocktails, and particularly enjoys it in the 19th Century cocktail (a riff on the 20th Century) devised by Brian Miller during his time at Pegu Club. Toast the cacao nibs in a 350-degree F oven until aromatic, about 5 minutes, taking care not to burn. 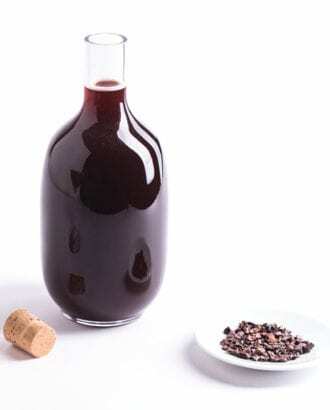 Combine the hot cacao nibs with the rum in a zip-close plastic bag and place in a large bowl. Submerge the bag in boiling water and let it soak until the water comes to room temperature. Using a chinois or a mesh strainer lined with cheesecloth, strain the infused rum into a large bowl. Discard the solids. Add the sugar and salt, then stir until fully dissolved. Pour into a jar or other airtight container, seal and store at room temperature. You might know it as “The Dude’s” favorite drink in The Big Lebowski.